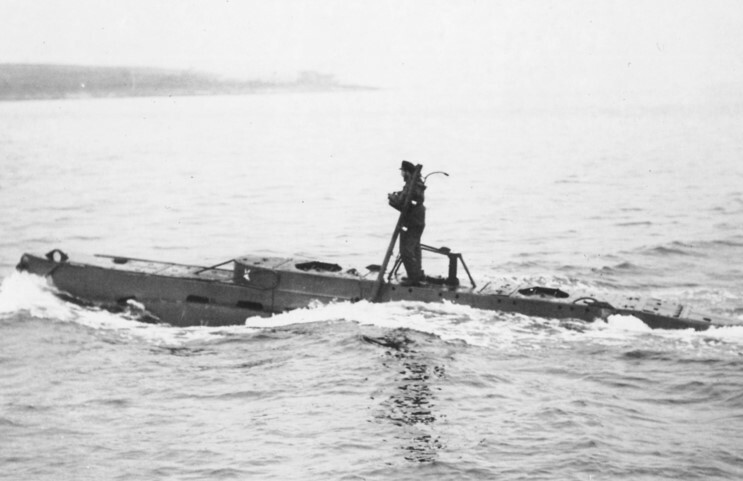 The British Midget Submarine HMS X-22, was involved in towing exercises off Dunnet Head, with HMS Syrtis, in preparation for an attack on the German battleship Tirpitz, when heavy seas and gale force winds washed the Syrtis’s Officer of the Watch, Lt. C. Blythe, RNR, overboard. The towing submarine immediately turned to rescue the officer and in doing so collided with X-22. The small X-craft sank almost immediately with the loss of her crew of four. Lt. Blythe was not found either. The collision position is given as 58 43 42N, 003 18 00W. Built by Markham & Co., Chesterfield, X-22 had length overall of 51ft 7in, beam 8ft 6in (with charges) / 5ft 9 1/2in (without charges), displacement without charges of 27 tons (surface) / 29 1/2 tons (submerged). Her diving depth was 300 foot and her speed with charges was 6.5 knots (surface) / 5 knots (submerged). She had one shaft and her armament was 2x2-ton side charges and Limpet mines. Her endurance on the surface was 1320 miles at 4 knots (with charges), 1860 miles at 4 knots (without charges). When submerged she could travel 80 miles at 2 knots (with charges). She had a complement of four men. The top photo shows an X-craft under construction. More information on the British Midget Submarines can be found by clicking here.